Hawaii Volcanoes National Park is the most popular attraction in Hawaii and should be considered a "must visit" on your tour of the Big Island. The Park is like no other place on earth. The cornerstone of the Park is the active Kilauea Volcano. Imagine standing on the summit of the most active volcano on earth. Hike into Kilauea Iki, the volcanic crater which was recently a lake of oozing lava. Witness steam vents, sulphur banks, lava tubes, historic lava flows, thick and lush rainforest, and raw coastline that continues to expand. With so much to see, plan to spend at least a day or more. 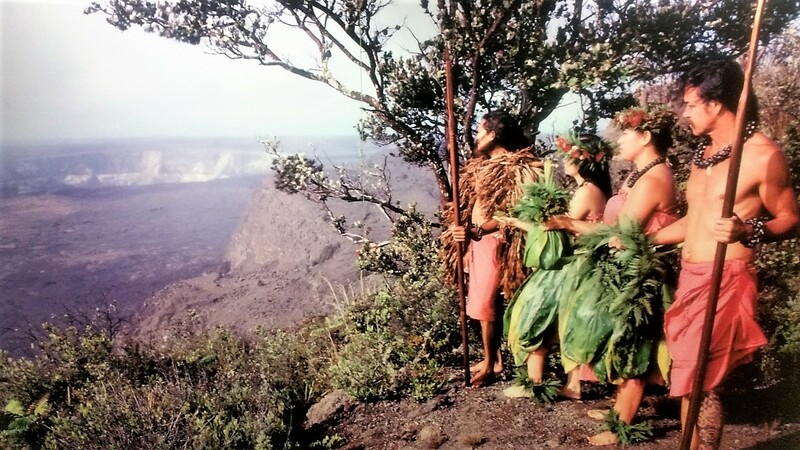 Where is Hawaii Volcanoes National Park? The entrance and the Kilauea Visitor Center are located on Highway 11, a little over two hours from Kailua-Kona and approximately 45 minutes from Hilo. The Park is open 24 hours a day all year and your $25 vehicle entrance pass is good for a week. The focus of the Park is, of course, the Kilauea Volcano, the general study of volcanoes, and the magnificent rainforest. Just past the entrance to Hawaii Volcanoes National Park, the road to your left leads to the Kilauea Iki Overlook, Thurston Lava Tube, and Chain of Craters Road. Keep that in mind for later, as we recommend continuing straight to the Visitor Center for a nice overview of the Park, maps, current conditions, hiking trails, plus interesting exhibits highlighting various geological, environmental and historical features of the Big Island. The Kilauea Visitor Center is open daily from 8-5. Less than a mile past the visitor center on the left is Steam Vents. Stop here to witness how ground water seeps down through cracks in the surface lava, meets hot subsurface volcanic rock and returns to the surface as steam. Looking around, note how void the area is of trees. The ground only a few feet below the surface is too hot for trees to survive. Across the road from the Steam Vent parking area is a short trail that leads to Ha'akulamanu Sulphur Banks. This is a nice stroll through lush vegetation on a paved path that eventually becomes a boardwalk when you reach the sulphur banks. What you see is the result of volcanic gases mixing with the groundwater steam seaping out of the ground. 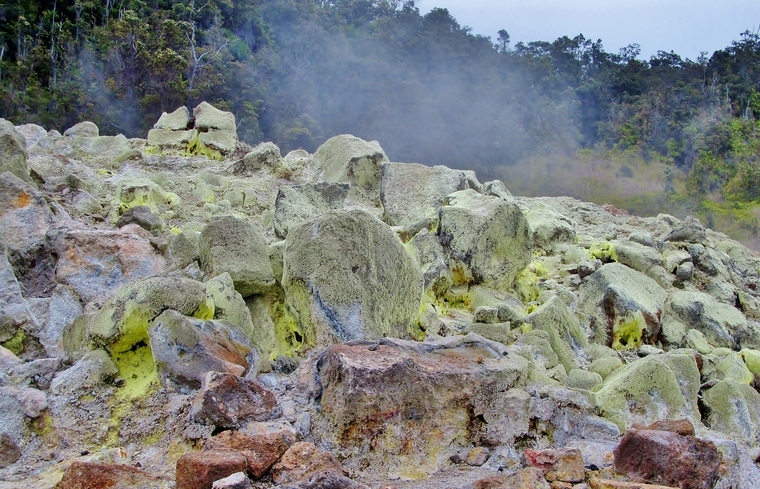 In places, pure sulphur crystals have been formed. That familiar "rotten egg" smell comes from a combination of sulphur dioxide, carbon dioxide and hydrogen sulfide. This walk is not suitable for visitors with heart or respiratory problems. Continuing on Crater Rim Drive you will come to the Jaggar Museum adjacent to the Hawaiian Volcano Observatory. The focus of the Jaggar Museum is the study of volcanoes, volcanic phenomena and seismology. There are fascinating displays on famous volcanoes, volcanic eruptions and earthquakes around the world, complete with working seismographs monitoring local movement. The overlooks near the museum offer a splendid vantage point for viewing the Halema'uma'u crater and the Kilauea caldera (summit crater). This will definitely be one of the highlights of your visit to Hawaii Volcanoes National Park. Parking and restrooms are available at the museum. Heading back toward the Park entrance, turn right onto Crater Rim Drive right before the entrance station. 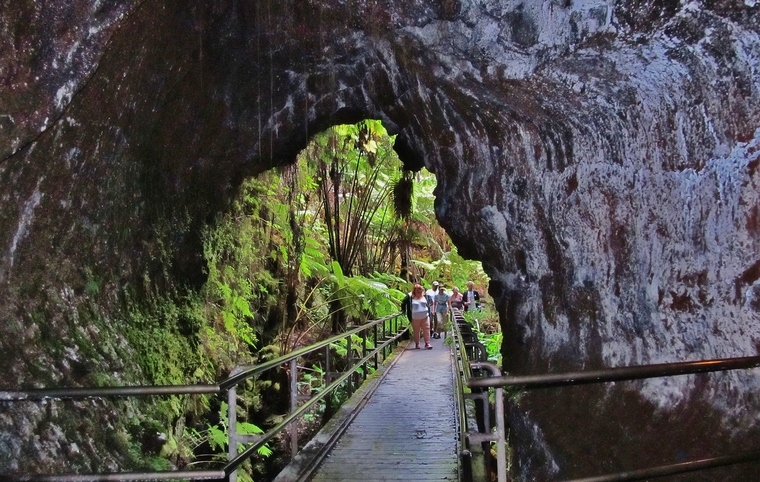 In a little over 1.5 miles (2.4 kilometers) you will come to Thurston Lava Tube on the left side of the road. Thurston Lava Tube (Nahuku) is a stunning example of a historic lava flow. A lava tube is a sort of cave formed during an eruption when the thicker and slower moving lava flow on the surface cools and begins to form a hard outer shell. After the faster moving lava underneath has passed through, what is left is a tunnel or tube. Make a point of stopping here; it's an easy walk and well worth your time. A couple of miles past the Thurston Lava Tube, Crater Rim Road meets Chain of Craters Road. Turn left and follow the road as it winds across a dramatic landscape of old lava flow and dry lava lake craters. Chain of Craters Road ends abruptly after 18 miles, along the coast near Holei Sea Arch where the lava flow from the Pu'u 'Ō'ō vent of the Kilauea Volcano crosses the road. Hawaii Volcanoes National Park is one of the true gems of the Big Island. Give yourself plenty of time to explore all the wonders of the Park. If you prefer to spend less time driving and more time sightseeing, inquire about our exclusive private Kilauea volcano tour, offered daily. 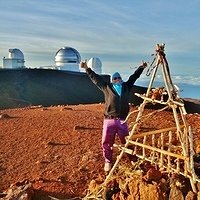 These guided tours are a fun way to learn more about the park and the Hawaii Island volcanoes. There is plenty of splendid hiking in the park. It is possible to hike from the end of Chain of Craters Road approximately 5 miles (each way) to the edge of the current Pu’u O’o lava flow. This is a very challenging hike that should only be attempted by advanced hikers. Heading back toward the Park entrance, our favorite hike in the Park is the four mile Kilauea Iki loop. 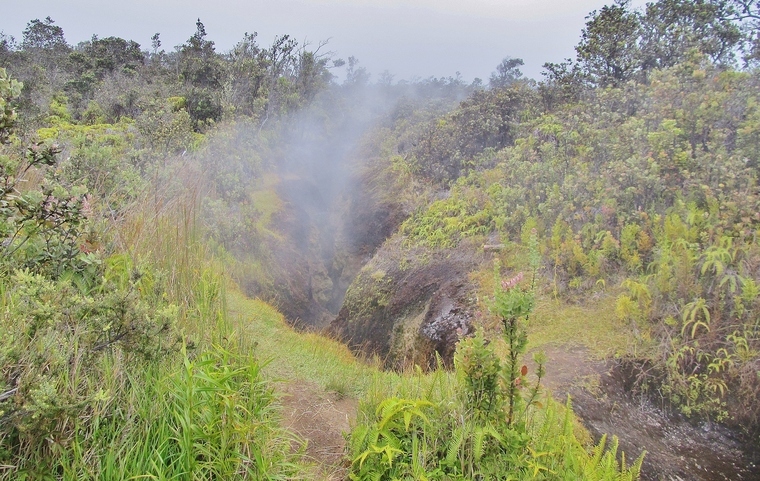 This spectacular hike drops to the lava lake bed at the bottom of the massive Kilauea Iki crater, still steaming from activity far below the surface. 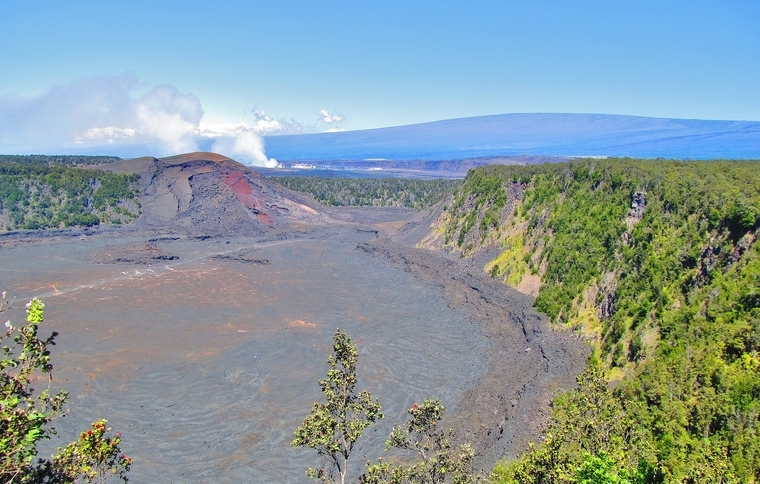 Even if you aren’t up for a hike, stop at the Kilauea Iki overlook to enjoy the marvelous view of the crater, with Mauna Loa towering far in the distance (see image at top of this page). Mauna Ulu is another great place to explore, a few miles farther down Chain of Craters Road from Kilauea Iki. 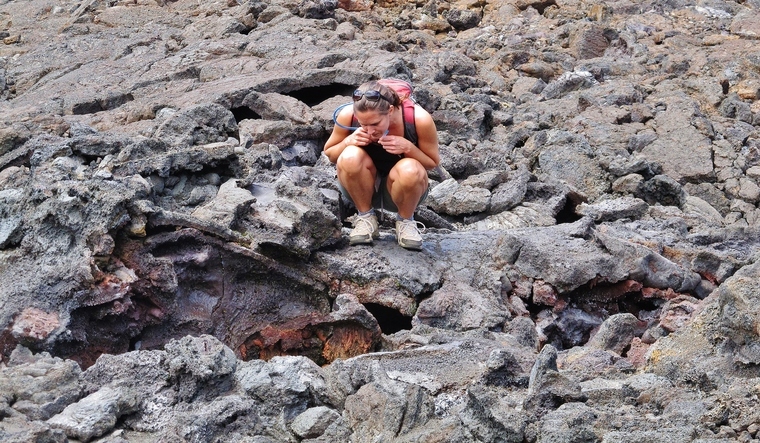 This short hike brings you to the top of the Mauna Ulu volcanic cone, where one of the longest known rift zone eruptions of Kilauea took place between 1969 and 1974. There are two drive-in campgrounds in the park. Kulanaokuaiki Campground is free and is located 5 miles from the Park entrance off Chain of Craters Road. Look for the Hilina Pali Road turnoff and continue another 5 miles. There is no water and you can stay up to 7 days. Back on Highway 11, there’s a great campground just 3 miles west of the Park entrance. Namakanipaio is a beautiful drive-in campground surrounded by towering eucalyptus trees. We loved it more when it was free, but it's still nice with a good vibe. There are only a few individual camping sites with barbecue pits. Otherwise you can pitch your tent in the large, open grassy area in the middle for shared camping. There are nice restrooms, running water, and picnic tables. Fires are only allowed within the barbecue pits. There is a pay station on site: $15 for drive-ins, $10 for walk-ins. Plan to arrive early since it's small and fills up. When camping at Namakanipaio, we enjoy the pleasant half-mile hike to the Kilauea Overlook adjacent to the Jaggar Museum and Hawaiian Volcano Observatory. Bring a headlamp and walk over after dark to witness the glowing crater. Spectacular! The weather down here is variable and unpredictable. You may find yourself standing in a driving rain one minute and sweltering sun the next. Nights can be quite cool, so if you are camping be sure to pack plenty of warm clothing. If you need gas or a snack before getting back on the road, the quaint village of Volcano, Hawaii is just 2 miles north. 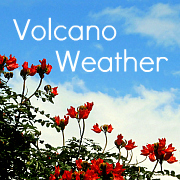 Check our Volcano Restaurants page for a list of area dining establishments. Enjoy your visit to Hawaii Volcanoes National Park!